The CHDR building comes in a simple rectangular three-layered box sandwiched between two elongated perforated steel screens. This lends it an appearance high-powered enough to stand out in its industrial context and makes space for future extensions. The screens shield off the sun and temper the wind, keeping the necessary building services to a minimum. A broad buffer space between the screens and the building doubles as balconies for the adjacent offices and as an escape route. The building proper divides into three zones: a narrow row of offices, a central zone for circulation and services and a broad belt of research labs. It was expanded in 2004. 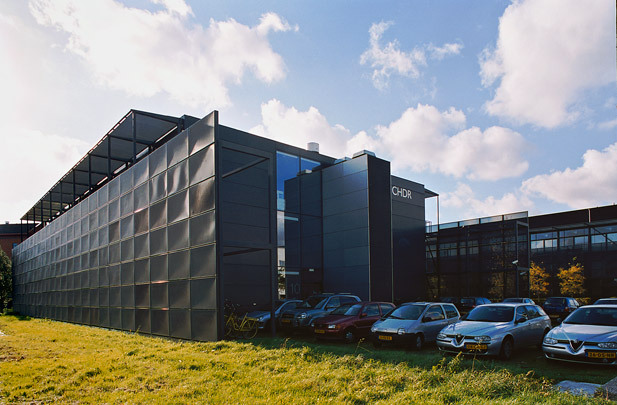 A second research laboratory, similar though larger, was added alongside the CHDR in 1998.